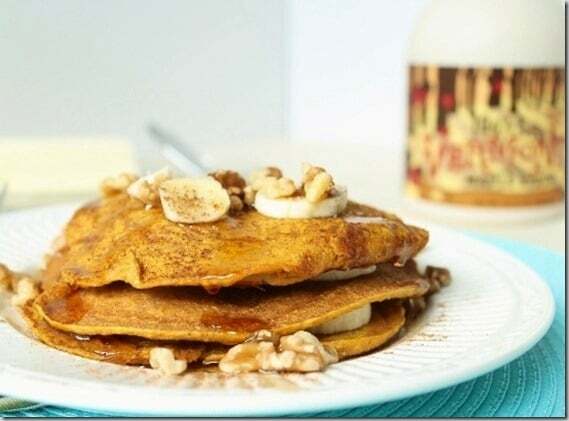 Oatmeal pumpkin pancakes are a delicious fall inspired weekend breakfast. They’re made entirely with oat flour for a healthy (gluten-free) start to the day. 1. It’s Sunday. Otherwise known as “pancake day” right? I mean, what good would it do you if I posted a pancake recipe during the work week when you’d just have to bookmark it and wait out the whole rest of the week before having the time to make it on the weekend? I’m just trying to save you from that torture. 2. I’m not quite finished with the pictures of the brownies. Oops. When it comes to pancakes, I’m not ashamed to admit that 95% of the time I use a mix. Trader Joe’s multigrain pancake mix is where it’s at and if I had that on hand yesterday, I probably would’ve just added the pumpkin straight into the mix and called it breakfast. Unfortunately though, I haven’t been to TJ’s in more than 2 months and we’re out. Between my pancake mix, veggie masala burgers and pizza dough, it’s getting tragic over here. So, I improvised and used oats instead in these oatmeal pumpkin pancakes. I also had just finished up the bag of flour and didn’t want to open another. Oat bran is another great option in situations like this – see these cinnamon raisin oat bran pancakes. So hearty and tasty! If you thought these recipes all came from diligent thought and not my pure laziness at times, sorry to have burst that bubble for you. Sometimes laziness can be tasty though. If you could taste fall, these would be it. Pumpkin + spices + maple syrup. Pumpkin in pancakes is one of my favorite. Don’t miss these protein pancakes either – they’re actually a pancake recipe I like to make in batches and freeze so I can have some filling, protein-packed pancakes any day of the week! The brownies are coming, I promise. 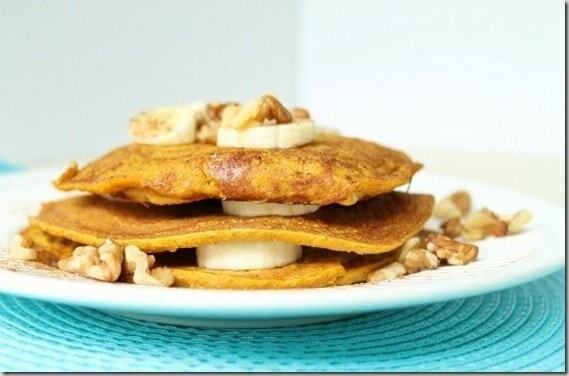 Oatmeal pumpkin pancakes are a delicious fall inspired weekend breakfast. They're made entirely with oat flour for a healthy start to the day. Preheat griddle or pancake pan to medium on stove top. In a food processor or blender, pulse oatmeal until finely ground (almost flour consistency). Transfer oat flour to a bowl and add remaining ingredients. Grease pancake pan and pour batter on pan. Flip after about 90 seconds until fully cooked. What’s your favorite pancake topping? I usually top mine with yogurt, fruit and maple syrup. I skipped the yogurt this time though. What’s your workout today? I’m loving doing my long runs on Monday. Enjoying my Sunday without a long run hanging over me is much more relaxing! hey there! 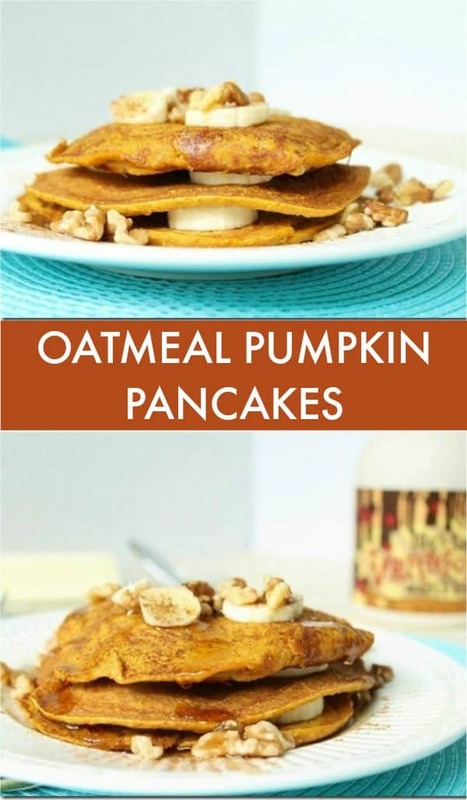 i just found your blog this morning and am loving poking around :) these pancakes look delicious… i am a huge fan of anything involving pumpkin and oatmeal. my husband and i just adopted a second puppy from our local animal shelter and her dna test showed us she has a good amount of weimaraner in her! i know absolutely nothing about the breed before we got her, but am excited to learn more as she grows up!! Well, expect a hyper dog! haha Weims are so much fun but what you read about them is true, they need lots of exercise :) Ours was pretty crazy for the first 3 years but now she’s mellowed a bit which makes things a little easier. I would take those pancakes ANY day!!! Great pics! I totally forgive you for not posting the brownie recipe because pumpkin + pancakes = perfect food! I love TJ’s pancake mix. Totally makes things easier on the weekend! Can’t wait to see the brownies. Love brownies. These already got bookmarked. Pancakes are my favorite breakfast. I made them for a workday breakfast this week and I was in a better mood for the whole day! Ahh these look fantastic. I only wish the weekend wasn’t so far away =(. I’ll be trying these out for sure! Oh these look awesome!! I think I saw these on one of the foodie sites..I read so many I can’t remember…lol! Brownies please :) I hope they have nuts and frosting on them. You know what’s really good homemade oatmeal cookies mmmm. Oh. my. goodness. I am gluten free and I was just searching for pumpkin oatmeal and came across these gems. No flour = I am so making these right now. Thanks to TJ’s certified GF oats and your recipe I can now have pancakes again!!!!! Thank you so much for sharing! I can’t WAIT to make these!!!! Is there a way to sub 2 egg whites for the full egg, or another alternative? you could definitely give the 2 egg whites a try. I haven’t done it, but I’m sure it would work! These pumpkins were AWESOME! I used egg whites instead of whole eggs and multiplied the recipe by 5! These pancakes reheat really well too, bonus! Just finished scoffing these tasty nuggets down. Thank you for the recipe!! Like some other reviewers I also made it with 2 egg whites instead of the whole egg. Because I used extra-large eggs the pancakes were border line soufflé-ish (totally my fault). Next time I will only use 3 egg whites and they should be perfect. My food processor didn’t get the oats into a fine flour but the pancakes conisitency was still right on the money. Not a bit of crunch. These were thoroughly enjoyed. Thanks for sharing. I’m going to share your link on my blog.